Ian over at TekDefense has a great post up on using volatility to analyze a computer that has been compromised with the DarkComet RAT. 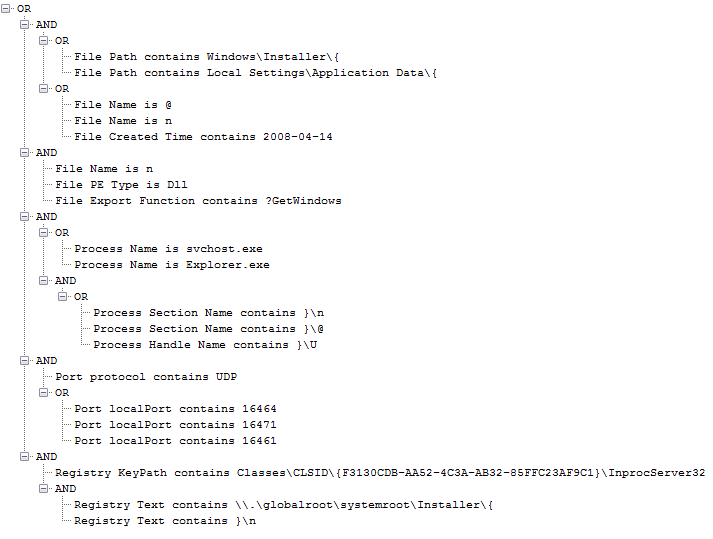 While reading through his post I noticed a section where he was using strings to find the config of the DarkComet RAT. Since the config was all in plain text I figured I could find it using volatility and volshell and maybe even write a plugin to dump the config. Hmm looks like Process runddl32.exe Pid 1524 might be the culprit. Juts for giggles lets do a quick handles and look for any mutants that contain DC_MUTEX in them. 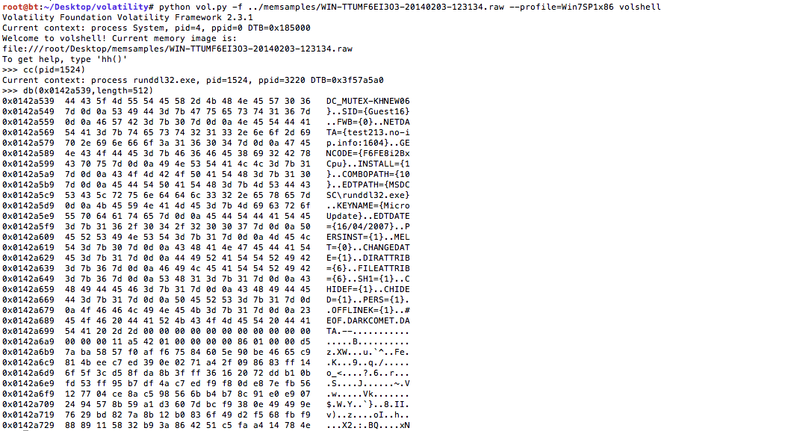 and then print out the bytes as a canonical hexdump from the address where we had the yara hit. Oohh look we see the mutex and a lot of the same config options as referenced in Ian’s post, it looks like the entire config is stored in plain text in memory. 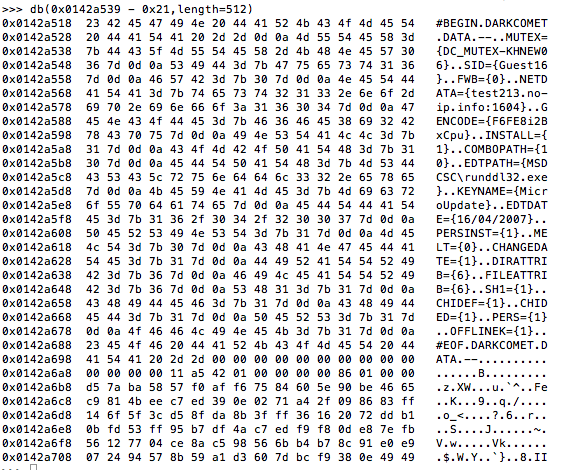 In Ian’s post there is also the string #BEGIN DARKCOMET DATA — I wonder if that can be found using volshell as well. Lets print the bytes again but this time lets move back 21 bytes from the address where we have the yara hit for the darkcomet mutex. In my testing I decided to look for the #BEGIN DARKCOMET and #EOF DARKCOMET instead of the mutex. The reason being I have seen a few dark comet instances with DCMIN_MUTEX as the mutex. Take a look at this search query over at totalhash to find some samples that have the DCMIN_Mutex. Also, in my config due to the way I decided to try and dump the config I have had to build in a dumper that will dump 400 bytes after the start address. If anyone has any suggestions or improvements to the code I would be more than happy to incorporate them 🙂 Below is the output of the config dumper using the memory image provided by Ian. Thankfully, DarkComet stores the config in plain text and made this plugin quite easy to write. If you haven’t tried out volatility you really should it is amazing what you can do with it. I have put the plugin up on github so feel free to grab it and test it. Let me know what you think and as always happy hunting! You might notice that 4D5A is the hex header for the magic number of DOS Executables. To me this looked like the attacker was uploading a exe through the webserver. I wondered if we would be able to extract through the logs what the attacker uploaded. 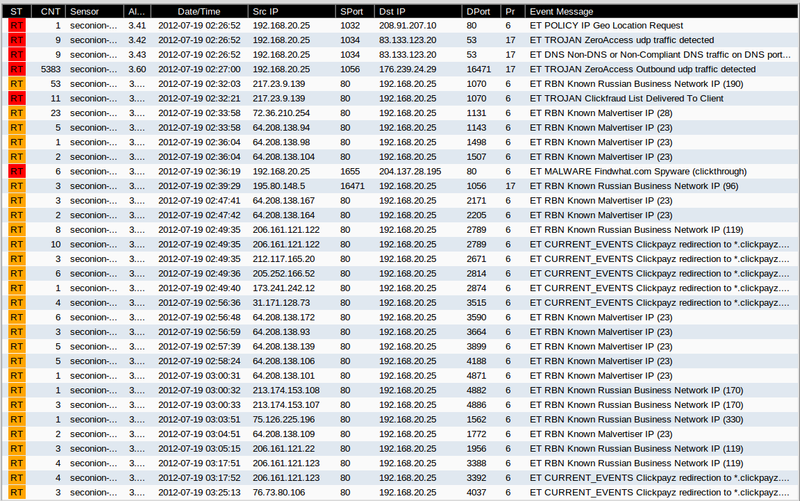 I then used awk to show me the 11th field of the logs which had the hex data for the exe they were attempting to upload. I then used a global search and replace in vi to remove the following characters ^” from the begining and ^”_ from the end. This gave me a text file full of hex, I then copied the hex and pasted it into a hex editor and saved the results as fg.exe. I then copied fg.exe over to a vm I use for testing suspicious files. I then ran the following fg.exe /? After seeing this was successful I looked for any other entries in the logs that looked like the attackers where uploaded an executable. I was able to also recover a 32 bit and 64 bit version of windows credential editor. Being able to carve these files out of IIS logs was very helpful and eye opening and allowed us to confirm what the attacker was able to run. Who would have known that IIS logs could be used to carve malware and not be used generally for web site usage statistics. I previously posted about using Redline and OpenIOC to detect a system infected with ZeroAcces. I recently as reading through the postings on the Emerging Threats Signatures list and saw there was recently two signatures added for ZeroAcces. Following the easy installation for security onion I was up and running in a few minutes with just a few clicks. I then decided it was time to run the malware I used in my previous post. With in a few milliseconds I had hits in the sqgil console that looked interesting. 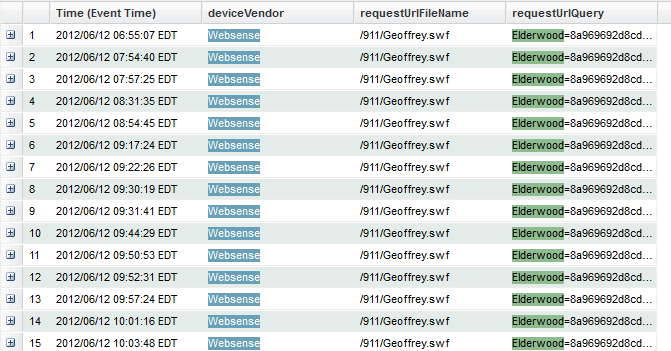 I started to review the alerts and started with the first hit “ET Policy IP Geo Location Request” I had sguil provide me a transcript of the session and here is what was provided. Note, I have removed all the location based data in the response hence the blank fields. 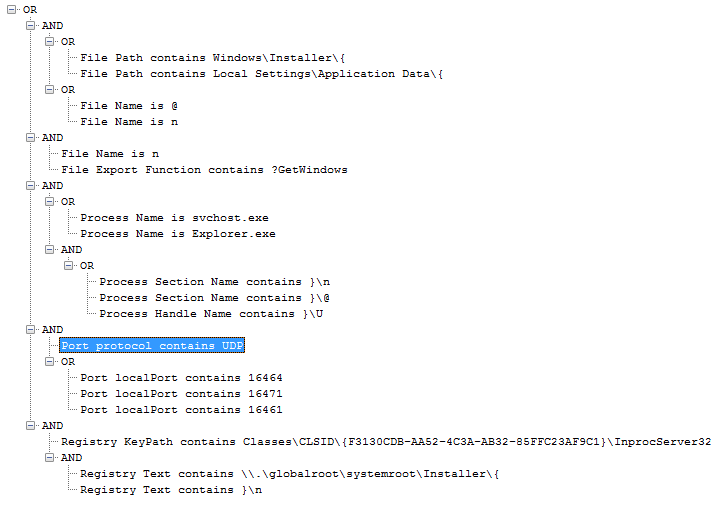 I then looked into the “ET TROJAN ZeroAccess udp traffic detected” hit and reviewed the packet data in sguil note the highlight portion in the data section is what caused the IDS rule to fire. I then went and looked at the ET TROJAN ZeroAccess Outbound udp traffic detected, again the highlighted portion in the data field is what caused the IDS rule to fire. With in a few seconds the count for this rule was increasing and the destination ip’s were all different and continues to increase so the rule is quite noisy. At this point the recent ZeroAccess signatures from Emerging Threats hit, they show a DNS query associated with the malware when first run, and the attempted communications outbound to the ZeroAccess P2P network. At this point you could say based on network evidence the system was compromised. However, you could take it a step further and use the IOC previously discussed and check the suspect system to see if there any other hits to confirm the compromise at the host level. I decided to let the malware run a little longer and saw some other interesting hits. Obviously, the malware is involved in some click fraud. I never used the system after running the malware I just watched and it sure looks like it was busy. Here is all the alerts it generated in sguil after running for about an hour. Note the number in the CNT column for the ET Trojan ZeroAccess Outbound UDP detected and you will see why I mentioned it was noisy. The other night I happened across a tweet from Ken Pryor @KDProyr saying he was looking at a system that was infected and he thinks it was using P2P based on firewall logs. Well based on some things I had seen recently at work I thought it might be a variant of ZeroAccess. I quickly fired off a couple of tweets to Ken asking if it was happening over a particular UDP port and from there where I thought the malware might be. Ken quickly confirmed that the malware was indeed where I said it would be. Yah! I was excited because I had provided help to someone else in the DFIR community even if it was just a small amount of help. I then noticed Ken mentioned he was using Mandiant’s Redline for analysis and I thought why not try and write an Indicator of Compromise (IOC) and see if it hits. I luckily had a recent copy of a ZeroAccess variant for me to play with to create the IOC. Mandiant’s Ryan Kazanciyan has a great blog post about using Redline and OpenIOC to build effective indicators and I used that as a starting point for creating this IOC. I quickly loaded up a vm and did a registry snap shot and ran the malware and waited a few minutes took another registry snapshot and rebooted to see if the malware persisted. Sure enough it did so I went and ran a Redline Audit to get an idea of what was going on and to help create my IOC. 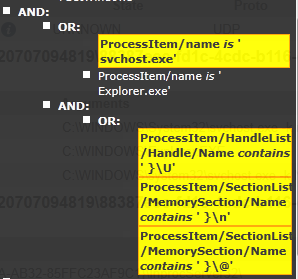 Redline quickly showed two process that based on their Malware Risk Index (MRI) score are process I should look at and a few others that I might want to take a look at as well. I quickly reviewed the Malware Risk Index report for svchost.exe and noticed under the Named Sections section a few negative factors. A few that were injected into that process and two that were not signed and they looked to be in a rather odd location. 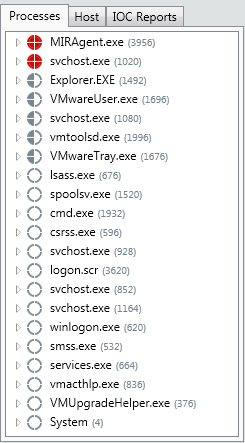 I then moved on to looking at the file handles that svchost.exe had opened and saw a few entries all from the same c:\windows\installer directory. 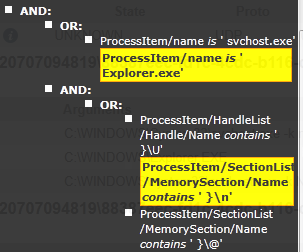 So far I have a pretty good list of indicators but I wanted to take a look at the Explorer.EXE process as well just to see if anything there was interesting as well and sure enough in the Named Sections there was another hit that stuck out. That registry key change also matched the key specified in this Sophos blog post so I took that as another indicator to use and started building the IOC. Notice something on the file hits? All of the files have a created date of 2008-04-14 12:00:00Z I know that is something that can be modified by the malware author but I thought it was unique enough I should redo the indicator to include that date for file created time. As you can see we found a few extra directories that were not there previously. At this point I think I have a pretty good indicator. I sent Ken a DM on twitter and asked if he would like to run my IOC through his Redline Audit to see if it worked on his infection. A little while later he sent me the report and sure enough he had hits across all the indicators, files,ports,process,registry.Yah! Glad to know it wasn’t just working on my instance of the malware, I then had another case at work based on network traffic that appeared to be infected. We grabbed a quick Redline audit of that system and used the IOC and sure enough we had hits there to so I think I have enough confidence in it to release it to the public. I will be posting the IOC to Mandiant’s OpenIOC Forum and to forensicsartifacts.com shortly and will update this post with links to the IOC once they have been published. I hope others find this useful. If you have any feedback or suggestions for modifying the IOC please let me know. If you have been reading any of the blog posts or the twitter verse the past few months you might have seen reference to some Adobe Flash and Microsoft 0-days being used and maybe wondering if you have been a victim. Using nuggets of open source intelligence like info from these posts by ShadowServer and Sophos you just might have enough data to search your proxy logs and see if you have experienced any of these attacks. You do have your web traffic going through a proxy don’t you? If you don’t you should start doing it and start collecting the logs. The logs are a treasure trove of information if you want to go hunting. So let’s go on a hunt. For this hunt like previous onces I will be using ArcSight Logger because that is what I have access to. 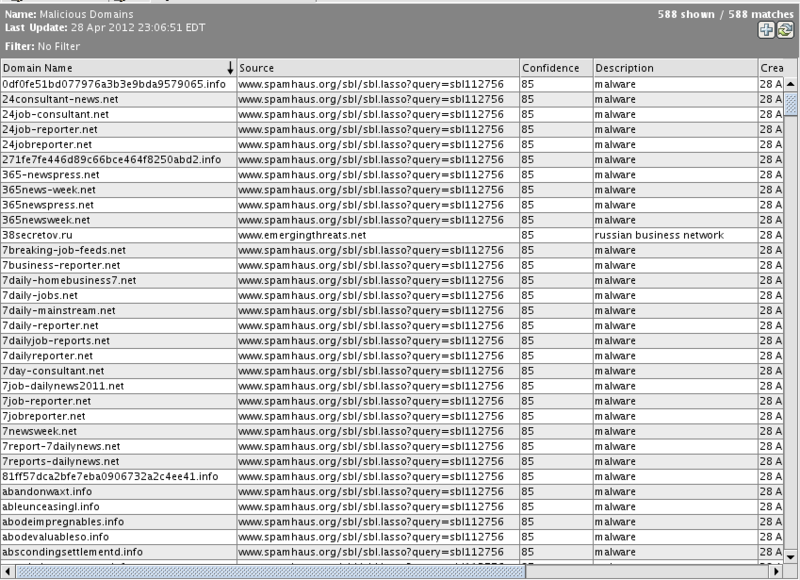 I will also be leveraging websense for the proxy logs as well. Notice the swf file is different but the query was for Elderwood. If I had just put BrightBalls.swf?Elderwood as a search parameter I would have missed it. Good thing the bad guys used the same query string. So do some experimenting you might find slicing and dicing on key terms will get you more data and more places to keep hunting. Now for me this showed a sign I needed to do more digging and going for some packets to review if you have them and perhaps another search this time adding Geoffrey.swf as a search parameter to see if there is anything additional there. Create active list for monitoring, create rule to populate the active list when a domain query matches a domain you are monitoring, create active channel/data monitor to watch for events. This is a very basic active list/correlation rule example you can do much more but this should be a decent starting point. Next in the Inspect/Edit Panel modify the Active List to meet your needs but in this example it will have the name “Suspicious Traffic”, it will expire entries in 3 days if an entry is not updated, 10,000 entries will be allowed. 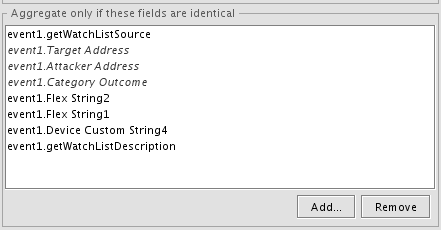 These are all changeable fields after the active list is created. For this example we will be firing on every hit which can be noisy. You might want to tune for your environment and capabilities but this should be a good starting point. 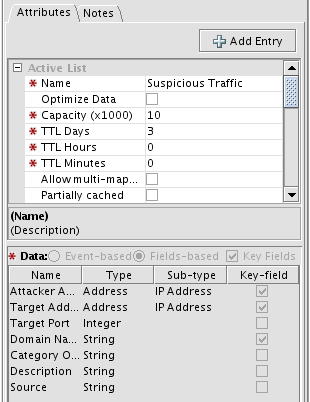 Next we will build some local variable that will help with populating the Suspicious Traffic Watchlist we created. 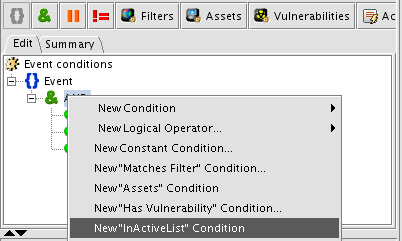 Click the Local Variables Tab. 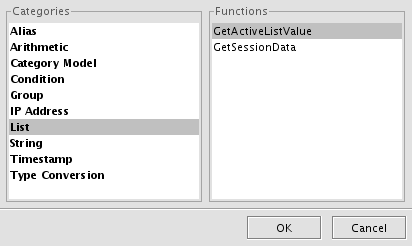 Click the + button and add a new Local Variable select List from the Categories Window on the Left and the GetActiveListValue in the functions window. The variable name is getWatchlistSource and it’s settings are below. The first string argument source is from the getDomainWatchList variable we just created above. The second string argument is blank for this rule variable because we are only matching on this one source. Next create one more variable using the Concatenate function caused getWatchListDescription. The first string argument source is from the getDomainWatchList variable we just created above. This two has a blank string argument for the Concatenate function. 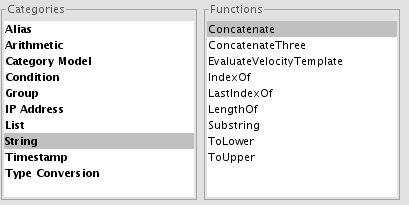 Now that all of our variables are set we need to make sure they are aggregated so they get populated when a rule hits. Click on the aggregation tab and under the Aggregate only if these fields are identical and click the Add button. 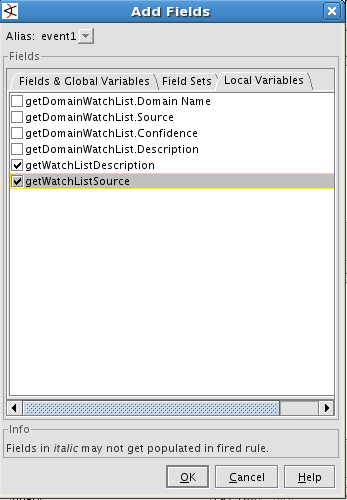 Select the variables getWatchListDescription and getWatchListSource we just created. Click ok and let’s get to working on the actions for the rule. First we need to set a few fields that we will use to populate the event created when the rule fires. 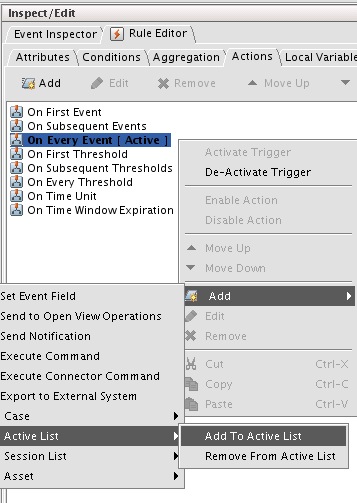 Deactivate the On First Event Action and enable the On Every Event Action then right click and Select Add -> Set Event Field . 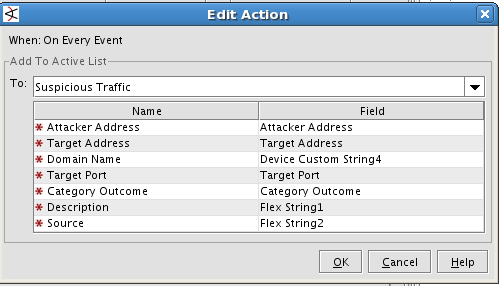 Let’s use Flex String 1 and Flex String 2 for that purpose and use the variables we created above and click OK.
Now we need to add any systems that match the rule to the Suspicious Traffic Active List we created at the beginning of this post. Right Click the On Every Event Action then right click and Select Add -> Active List -> Add to Active List below are the mappings for the fields in the Active List. Now we are ready to apply all the conditions for the rule and deploy it as a real time rule. Once it is deployed as a rule you can try and generate some test hits by doing lookups of domains in the active list against the server creating the DNS logs. Just make sure you know the address of your system :). 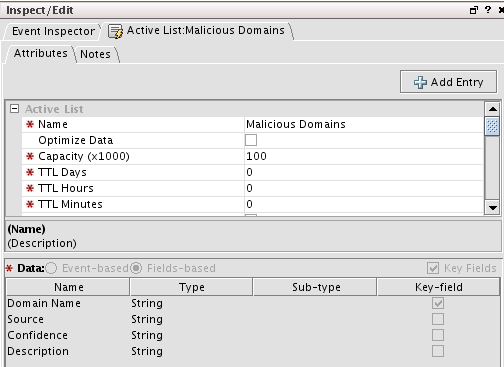 To monitor for events create an Active Channel where the filter is Name = Discover Malicious Domains or whatever name you gave the rule above. If everything works you should soon see events in your active channel. You can then look at the entries for your Suspicious Traffic Active List and you should see entries in there that match the results in the active channel. Now you can start to have some fun and create dashboard with data monitors around these type of events below is a screen shot of a sample dashboard. 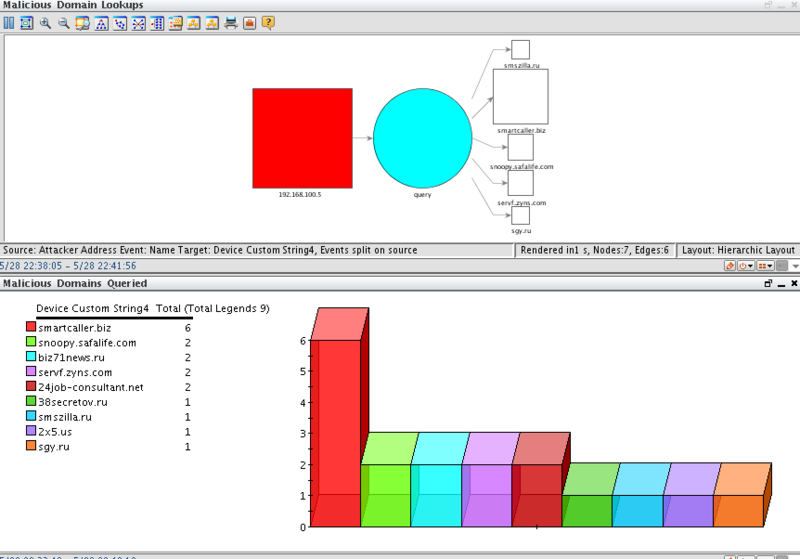 The top half is of an event graph and the bottom is the top bucketized count of malicious domains queried. Now the rest of the content creation is up to you but hopefully this gets your juices flowing and you come up with some other great use cases for CIF related data. As always happy hunting! If you use ArcSight hopefully by now you have come across the great ArcOSI Project for generating content for use within ArcSight. I have used it in the past and liked it but I found myself having to look for more context around the alerts it generated. I recently came across the Collective Intelligence Framework (CIF) and really like how many intel sources it aggregates like ArcOSI does and how it stores the data from the intel source and I think this too can be a great source of content for ArcSight. I have previously blogged about integrating CIF and ArcSight, but that was just using CIF as a tool for looking up data with in ArcSight not using CIF to create content to be used by ArcSight. EDIT: 6/10/2012 if you haven’t seen @kylemaxwell ‘s Post Introduction to the Collective Intelligence Framework I highly recommend check it out! For the Scanner Traffic maybe instead of reporting on the noise of someone knocking on your door, you report on any traffic that was accepted (meaning authentication happened) but that is up to you. I have been working on a python script that assumes you are using the CIF Perl client to generate feed data in csv format, then the script will parse the csv files and send them like ArcOSI does to ArcSight via CEF over syslog. I have posted the script and a quick tutorial on it over at the Google Code Project cif-csv-parse-to-cef. A quick example for this post will be to generate the domain/malware feed using the medium severity and confidence level of 85, send it to ArcSight and have it add the feed data to an Active List. Part 2 of this post will cover writing a correlation rule to monitor the Active List for actionable data. 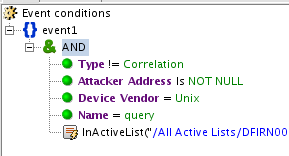 Click Apply and all that is left is to create the correlation rule to populate the Active List. Then click on the Conditions field and create the following filter. 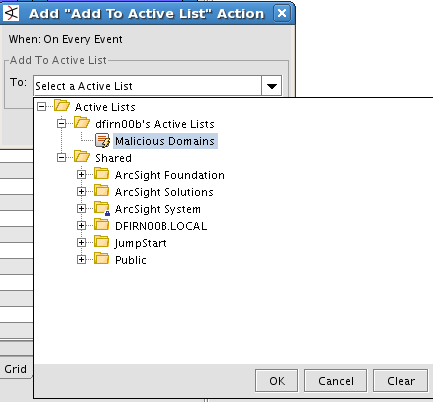 After selecting the Active List you will have to map ArcSight event Fields to the corresponding Active list fields. Once you click Ok, you will most likely get a pop up message similar to this that asks if you want to add all the ArcSight Fields you mapped in the previous step to the aggregation tab. Click yes, if you don’t then your active list will be blank after the rule fires. Now deploy the rule as a real time rule. Your account will need privileges to do that, If you don’t have them ask your ArcSight Admin to deploy the rule for you. Now the rule and active list have been created let’s generate content for the rule to populate the active list with. Now if you have an Active Channel up and running with a filter for Device Vendor = CIF and Name = CIF Malicious Domain you should see something similar to this. Now if you right click your active list and show entries you should also see that your Active List is being populated with data. This concludes Part 1 – Part 2 will cover writing a correlation rule to monitor the Active List for actionable data.